A week out from the race and I still wasn't sure I was going to go. Although the training was going ok now I still didn't feel 100% and I sure didn't want to risk hurting myself again. On Monday I did an easy 4 that went ok and then Tuesday I went out for an 8 miler and felt fine. So I planned to meet Laura on Wednesday with the plan to run 3 with her and then run back easy by myself while she picked up to her normal pace. So after an 8:20 "warmup mile" we dropped mile 2 down to 7:38, a bit zippy. Thats when she asked me how far I planned to run and after I told her she said she was really hoping I could stay with her the whole 8 she was doing. How could I say no to that? So I said I would but we were going to have to slow it back down and she was happy to do it. So I had a great run, a lot of fun and we averaged just under 8mp for the whole run ! Wow, 8 at about my expected race pace ! So on Thursday I went out for an easy 5 and feeling no pain or soreness left over from Wonderful Wednesday I was ready to commit to racing. An easy 4 on Friday and then I took a rest day Saturday and made the drive down to Wilmington. Went to pick up the packet and then a pre-race dinner with friends Ben and Tom. Got up Sunday and was happy that the cooler weather had moved in overnight. Saturday had been up into the low 80's and humid so 55F race morning was very welcome indeed. After taking the water taxi across the river I did my usual warmup routine. A mile jog, a little light stetching and then some strides 5 minutes before lining up. I felt good right from the beginning and after half mile we turned into the wind. Yes, the wind. about 12mph with gust near 20. And the first hill, actually one of the three bridges we would cross. I relaxed knowing now was not the time to be pushing anything and still was sub 8 so I had a good feeling about things. Mile 2 in the wind and across another bridge, and although it was not as much of a climb as the first one was my time was even better despite nearly being blown sideways by a gust. Mile 3 was probably the easiest of the day with all flat or slightly downhill with the wind at our backs and it was my fastest split of the day. The next couple of miles through downtown we were sheltered from the wind so not a factor. A lot of brick pavement so I was having to really focus on not tripping and then at mile 3.5 a very steep hill away from the river which was Umstead Turkey Creek worthy but it was only a block long and then after a turn climbing again but more gradually for a couple of more blocks slowed me down to 8:05. The next 5 miles were pretty uneventful. I just had everything on cruise control, no hills and with all the trees, and twist and turns around Greenfield Lake the wind wasn't a factor. All 5 of that section were sub 8 and I was feeling great. Most of my concentration was on running the tangents on this very curving road. It was a pleasure to run around the lake, a place I had logged 100's of training miles during the 80's and early 90's as well as the site of my first marathon back in 1981. My mile 10 split was great and then we came back out into an exposed road with the wind right in the face. Wow, I wasn't looking forward to that. Mile 11 was tough into it and I slowed to an 8:11 and then mile 12 included the big drawbirdge, every bit as long and tough as the one at OBX. It starts off steep on a spiral ramp and then eases off the grade a little after that on the actual bridge. I tried to hold pace as well as I could and really had to be careful across the grates of the draw section. It was a great relief to get off of them and then the 12 mile mark was just past the summit for an 8:18. At this point I knew I had the sub 8 race in hand, just had to get it over with. 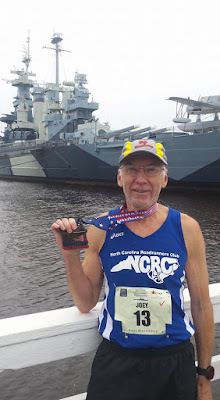 As always I can imagine the voice of Laura in my ear and now she was telling me to throw myself down the biridge like she tells me to do on the much smaller bridge over the Neuse on our regular route, so thats what I did passing several people along the way. I expected flat the remainder of the way so I was a bit disappointed to go around the curve and there was a small hill ! Grrrr. Took my momentum away for a minute and then it was time for the final push. I was still at 7:39 for mile 13 and then it was over. Woohoo ! Another solid half marathon in the comeback. I finished in 1:44:48, 5th out of 36 in my age group and 115th out of 1154 total finishers. Not too bad. I'm happy with that ! But I'm going to do a lot better in the coming months. Stay tuned for more exciting action !